There is nothing more delicious than food cooked on the grill, so now that summer is here you want to be ready for the cookouts ahead. The accessories you use can take your grilling to the next level, whether you’re trying to improve your skills, impress your family or show everyone up at the neighborhood block party; these tools will make you look like a pro, and won’t break the bank! Fire up the barbecue, grilling season is officially here. Nothing kills the mood at a barbeque faster than accidentally burning yourself. 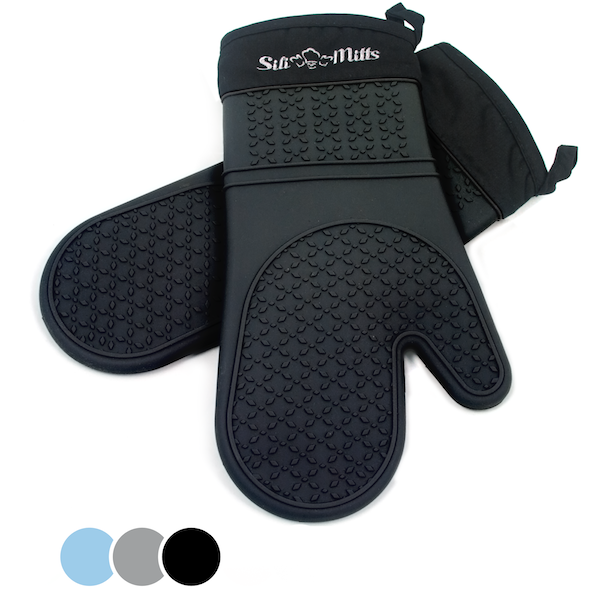 It’s always smart to invest in a pair of durable, high-quality oven mitts that can withstand the hot temperature of the barbeque. 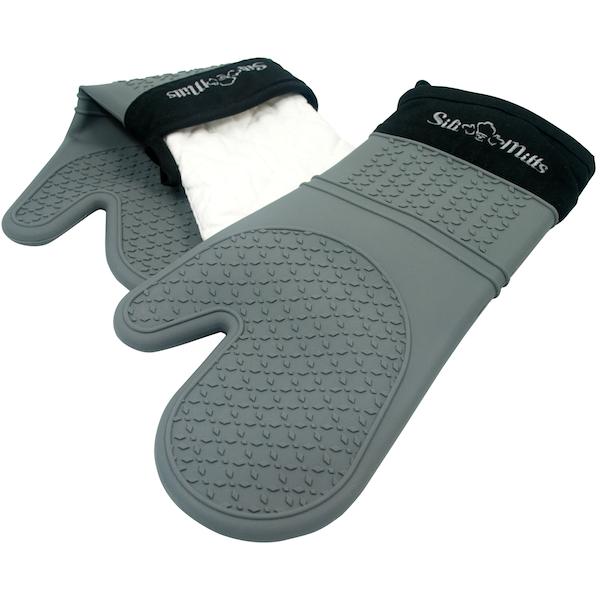 These silicone oven mitts by Frux Home and Yard are a NEED for barbeque season. I can’t tell you how many cloth oven mitts I’ve gone through because they either burned through or got too hot to use on the grill. Not only are these silicone ones heat resistant up to 482 Fahrenheit / 250 Celsius, but they are extra long to keep your forearms protected. They also come clean easily with warm water and soap, It’s one less thing you will have to scrub. You definitely won’t regret this purchase especially since they’re only $19.97 on Amazon.com. Until recently I didn’t even know they made wooden grill brushes, turns out they do, and I will never go back to my wire one. Ever wonder if the little bristles from your brush could fall into the grill or even your food? Well, they can! 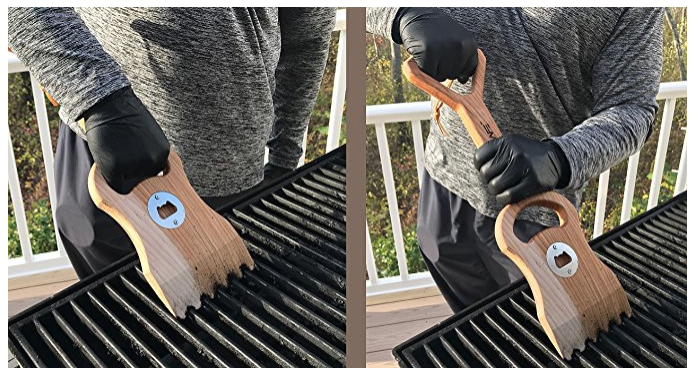 Luckily, this wooden grill brush by Grillsafe is all-natural wood from the USA with no plastics, nylons, or wire to pollute your grill or ruin your food. It is only $24.99 and entirely risk-free. The unique design is sure to get your neighbors attention and make you stand out, thankfully no two brushes are alike, which means when your neighbors start purchasing them too, they won’t be identical. 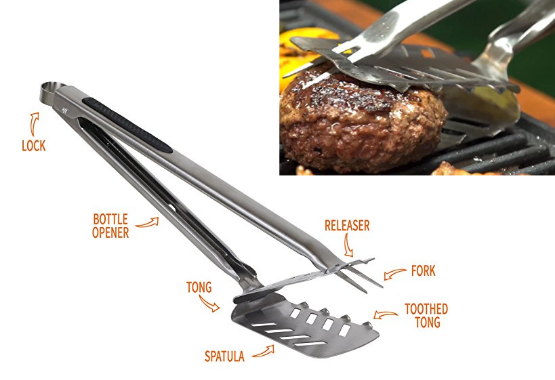 Show your guests how pro you are with this 7 in 1 BBQ tool. 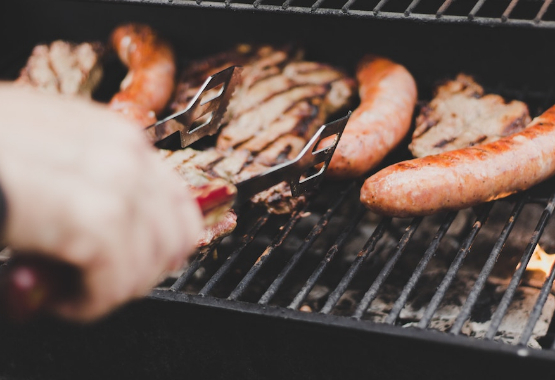 Different meats require you to use various tools, and now instead of bringing your entire set to a cookout, you can bring just one thing to handle all of the grillings. Okay, but it’s not just any one, it’s the swiss army knife of grilling equipment. With a spatula, two tongs, a fork that features a releaser, and a bottle opener this tool is worth the $19.99 that will save you space, time and dishes. The only thing that could ruin a barbeque more than burning yourself would be giving everyone food poisoning. Yes, to tell if your food is done, you can poke it or cut it open, but you'll lose a lot of juice and flavor, and do you really want to risk being known as the guy who made everyone sick? 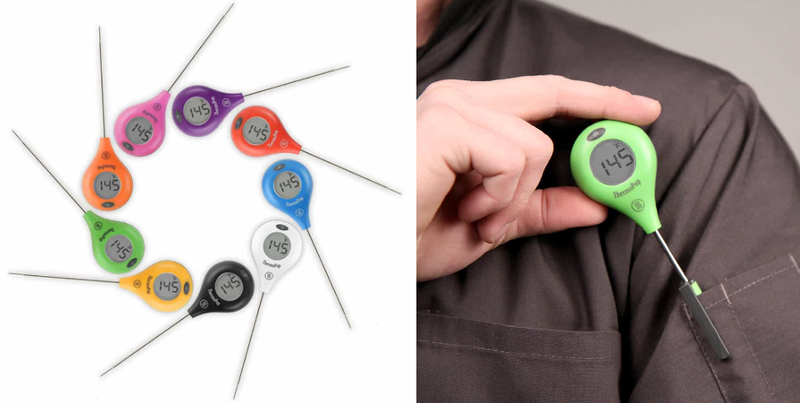 You don’t need to spend hundreds of dollars to find a good thermometer, but you do need to purchase one (and use it). This one works great, comes in lots of fun colors, and a simple button press rotates the display in 90-degree increments allowing you to hold it in either hand or read it when it’s upside down. It’s fast, accurate, splashproof, and also has a backlight. The $29.00 is well worth the peace of mind knowing that your meat is cooked through. Whether your barbeque is starting late or you just need a burger at 9 pm, having a high-quality light is essential for your safety. 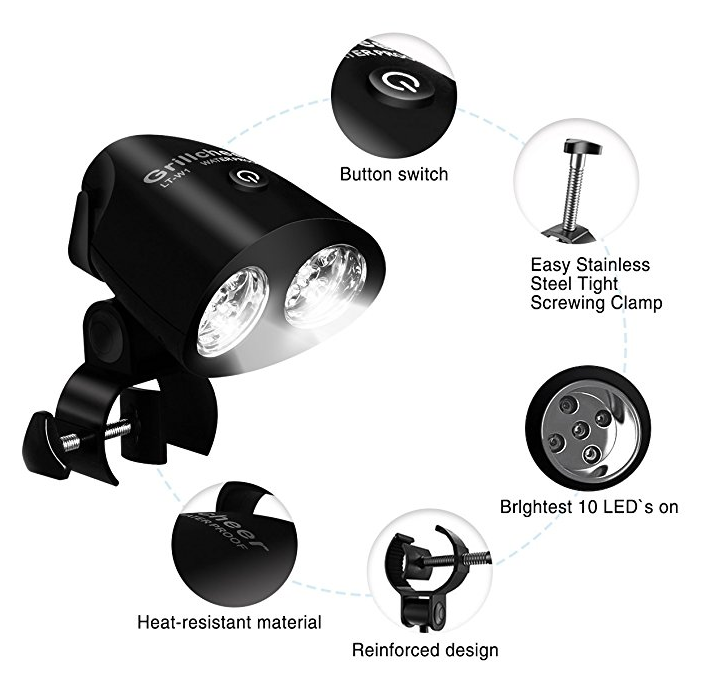 For $27.99 you can have a waterproof and heat resistant (to 365 degrees Fahrenheit) barbecue light allowing you to cook in both extreme heat and rain. This one is my favorite because instead of having a yellow glow, it features a white LED light that rotates 360 degrees and keeps your food looking clear, making sure you don’t overcook or undercook your meal. As if you needed another reason to purchase it, the product is backed by a 3-year warranty; if that doesn't make you want it, I don't know what will. Good stuff, worth the buy. These are just great oven mitts. Unlike more traditional mitts, these don't get dirty or wear out and if you get something on them they are easy to clean off. Construction seems pretty good, the grip is great, and no heat transfers through the glove. I've used them with lots, pans/skillets, pizza trays, casserole dishes, bowls, and all manner of materials including cast iron, stainless steel, glass, and ceramic/clay. An all around great product. I'm a convert - no more cloth mitts for me! Best mitt ever purchased !! The best oven mitts I have ever purchased. They actually went through the pizza oven the other day and came out unharmed. I have purchased many different kind of mitts for our business (commercial grade) and have had holes burnt in them or they weren't very pliable and hard to use. I would recommend these to anyone who uses ovens in their business. Thank you! No need to look further, these are the best! I've owned a lot of oven mitts over my life, and these are simply the best! Others may promise to be robust, but soon have problems with durability. And most, when wet, are not effective! I do have another pair of mitts from another company, also made (I guess) out of silicone, but they are so stiff they are very difficult to grip things with. Don't even get me started on fabric mitts. They scorch, they tear and as I mentioned you don't want to get them wet. These have quickly pushed all the others out of my utility drawer. Just bought another set for a Christmas present, they will be much appreciated. The reviews were correct. This is a very well-made, effective, and efficient product. I have used it for the oven, when I have to put trays in and take them out of there, and they have stayed intact. I used to get burned a lot but with these I don't have any issues anymore. The gloves are long enough where they actually cover a part of your arm, including your wrist. They are big enough to fit big hands, but also very comfortable for small hands. I usually buy Small size gloves for me and I haven't had any issues with the standard size of these gloves. They're nice, and not very heavy. The color is really cute -I bought the light blue and people love that color. Works for my husband and for me :) I highly recommend them!!! !